Okay. So, everything seemed to be going good. Klaus was searching for Hayley. Freya and Hope were spending some quality time together. Not to mention, Klaus and Marcel started working together again. Things were moving forward. Things were going good. Then, Hayley’s kidnapper was revealed. I bet you didn’t see that one coming! I know I didn’t. I assume we’re all a bit skeptical about how that’s going to turn out, right? Which way are they going with this? I think I sense an epic TVD style twist fluttering about. Who knows what will happen next! In the meantime, while we wait, let’s recap the show. I know you want to. Warning! This is a SPOILER ALERT! With Hayley still missing and Elijah no longer by his side, Klaus makes it his mission to rescue the crescent alpha come hell or high water. His daughter is counting on him, after all. Taking time out of his busy schedule, Klaus personally interrogates the three factions of New Orleans, handing out the usual threats if his wish is not quickly granted. Blood. Death. Gore. Vampire, witch, and werewolf all deny having any involvement in Hayley’s disappearance, causing Klaus to take drastic action. First, he compels a squad of New Orleans’ finest to lay the groundwork. Although humans have many limitations, Klaus needs eyes everywhere. Marcel thinks that this is a cause for concern. He appears, worried about Klaus’ state of mind. Marcel believes that whatever kind of retribution Klaus is seeking for Hayley’s kidnapping will ultimately hurt the city’s inhabitants. With his legendary temper and predilection for murderous rampages, Marcel warns Klaus to take caution. He must think first and act second. All of a sudden, a note mysteriously falls from the sky. How convenient! It’s a location. Klaus and Marcel, hereby known as The Sassy Duo, leave to investigate. They search an abandoned house, but no luck. Hayley isn’t there. Instead, they find bloody hand prints marking the walls. A chair, chains soaked in wolfsbane, vervain. A note that reads, “Freak. Filth. Crossbreed.” Someone has definitely been torturing Hayley, but where is she? Why do these people hate hybrids so much? Meanwhile, Freya takes a trip to Mystic Falls to visit Hope at Saltzman’s School of Witchcraft & Wizardry. With Vincent’s warnings about The Oracle’s prediction fresh in her mind, Freya decision to check up on her niece seems like a precautionary measure. She needs to make sure Hope isn’t getting into trouble. Which she is, of course. Because she was the one to put the cloaking spell on her mother in the first place, Hope has been looking through several different ancient grimoires to see if she can break the kidnappers hold on Hayley. Freya disapproves. It’s entirely too dangerous for a young witch to master such a sensitive spell. In order to tame Hope’s high ambitions, Freya tells Hope about the prophecy. Hope doesn’t believe she is capable of such destruction, but Freya pushes Hope to consider the consequences of her recent actions. Being the rebellious teenager that she is, Hope throws a tantrum, stomping her foot and almost setting her aunt on fire. Hope doesn’t like to be told what to do. Freya understands, but Hope needs assistance in honing her craft. Hope is hesitant to ask for help. Desperate to find Hayley before it’s too late, there’s only one thing Klaus can think of to do. He is sure one of the three factions took Hayley. It’s the only explanation that makes sense. To uncover which of his enemies is at fault, Klaus comes up with a plan. It’s not a very good plan, but a plan nonetheless. He kidnaps Vampire Josh, Collette (a witch), and David (a werewolf). Klaus orders Collette to perform a barrier spell to prevent any of his “friends” from leaving. Klaus believes that when the factions learn that their cohorts are missing, it will make them look for Hayley that much quicker. He thinks that the threat of death and gore will bring the kidnapper out of hiding. Marcel consults with the factions, but it doesn’t do any good. It only makes things worse. They’re tired of Klaus’ ways. They’re tired of being bullied and threatened. They are ready to revolt. 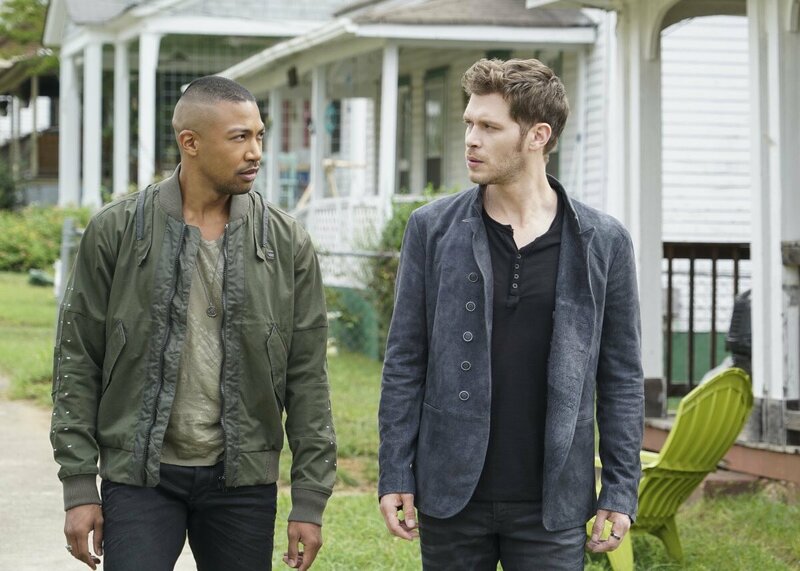 When Marcel confronts Klaus about his grand plan, another mysterious package arrives. Klaus opens the box to reveal . . .oh, goodness. It’s a large piece of Hayley’s skin. It’s her crescent wolf tattoo. These guys are not playing around. Seriously, Klaus. In a mater of seconds, Klaus confronts Josh, Collette, and David – despite Marcel’s insistence that he take a step back. Klaus breaks Marcel’s neck. Obviously. Knowing that their death is approaching, Collette breaks the barrier spell. David steps out and BOOM! He’s dead. Collette is next. Predictably, Vincent arrives just in time to protect Josh. It’s a good thing The Oracle told Vincent what was going to happen, right? Vincent puts Klaus down with a snap of his fingers. Weirdly, Josh is more upset with Marcel than he is with Klaus. He argues that it was Marcel’s job to stop Klaus from going overboard. Marcel could have prevented this from happening, but his leadership skills have been lacking lately. Vincent agrees, saying the blame lies mostly with Marcel, not Klaus. How crazy is that? When Klaus awakens, he finds himself in chains inside a wooden coffin, a barrier spell surrounding him. It’s just like the old days, isn’t it? As Marcel gazes upon his former friend, he’s understandably angry. Look at the position Klaus has put him in. Was everything Klaus said a lie? Well, sort of. Klaus reveals his true motivation in asking the factions for help. The witches actually looked for Hayley, so they’re in the clear. The werewolves? They were prepared to die for their alpha. So, they’re good. As for the vampires, well, they resisted the whole time. They’re obviously the ones at fault. Marcel questions why Klaus would alienate his allies if he needed help defeating the kidnappers. Klaus admits that in order to save Hayley his followers need to fear him and pointedly tells Marcel that his do to. Klaus really needs to be a motivational speaker, because immediately Marcel gathers his minions and lays down the law. He’s been a bit soft lately, but that is going to end. Until Hayley is found safe, the vampires need to hand over their daylight rings and keep to the shadows. Marcel needs to trust them. Klaus needs to trust them. Yes, it’ true. In a surprising turn of events, the two friends turned foes are teaming up to save the day. Go team! Later, Klaus asks Vincent for support, but Vincent refuses to help the vampires ever again. They’re on their own. Which is quite sad, considering the vampires are going to need the witches more than ever. In his anger, Klaus throws the box with Hayley’s dead skin in it (Yuck!) and breaks it. A message is revealed. It’s a coin. Klaus looks at it, as if he’s seen it before. He turns it over and realizes he knows who took Hayley. He’s faced this foe before. It was the Nazis who took Hayley. The Nazis. Dun dun dun! Why do you think Hayley was taken? What do they want? What is their connection to Klaus? How do you think Klaus & Marcel’s team-up will affect The Quarter? Will Hope fulfill the prophecy? Tell me in the comments!